Description This College Park, Georgia hotel has an outdoor pool, non-smoking guest rooms and an on-site restaurant. This hotel is also pet friendly. 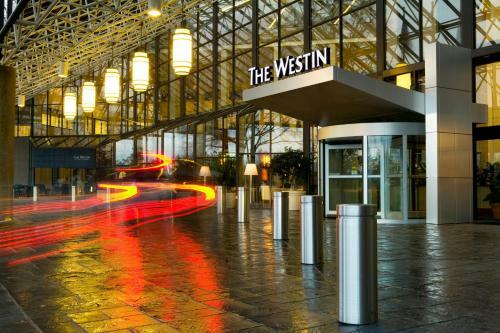 Everything at the non-smoking Westin Atlanta Airport from the free airport shuttle to outstanding indoor-outdoor pools and heavenly beds has our guests pleased they landed there. This 500-room 10-story hotel welcomes guests right off the bat with a grand 10-story glass/marble atrium lobby. The rooms are both high tech and high style outfitted with clean-lined designer furnishings include signature Heavenly Beds flat-panel wall-mounted TVs with jack pack connections and iPod docking stations. Standard Wi-Fi is free and upgrades to high-speed internet access is possible with an additional fee. The heated indoor and outdoor pools make a splash and the fitness room business centers restaurant and complimentary airport and MARTA station shuttle are all available 24 hours a day catering to guests' quirky schedule. Parking is available and pets are welcome both for an additional fee. The hotel is about one mile from Hartsfield-Jackson Atlanta International Airport and MARTA rapid rail and it's seconds from I-85 and I-285. The Georgia International Convention Center is just a five-minute drive. Hit the road or the rails and be in downtown or Midtown in about 20 minutes. There you can satisfy your thirst for culture at the High Museum of Art or the World of Coca-Cola stroll the campus of Georgia Tech or relax on the grounds of lovely Piedmont Park. 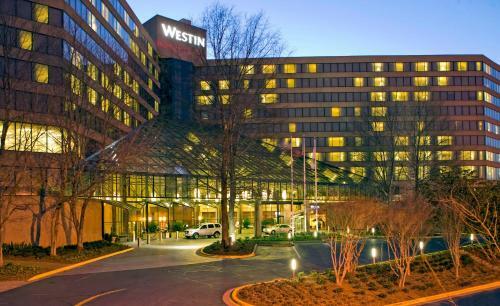 Add The Westin Atlanta Airport to your free online travel itinerary.